JUX Portfolio is an extraordinary Joomla gallery module to present your Gallery or Portfolio. It surpasses the traditional content displaying – instead of displaying items in defined frame design, JUX Portfolio displays thumbnails on Grid or Classical layout with different image sizes. So what’s new in the version 2.1.0? 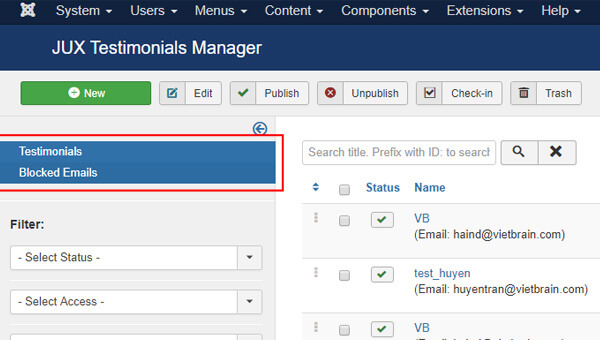 Fix conflict between Filter and Search function when 2 modules are published on the site. 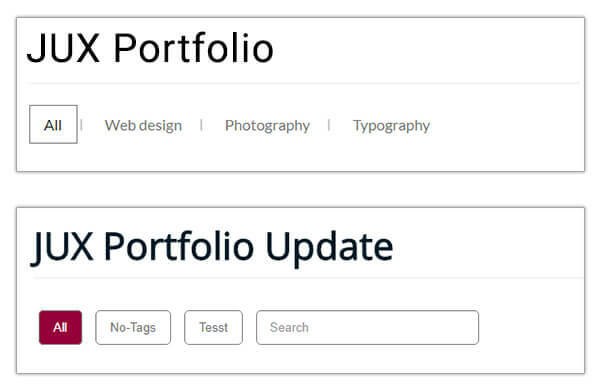 As the previous versions, when you set up 2 Portfolio modules on your site, Filter and Search functions will be in conflict. However, with the version 2.1.0, conflict is not a big deal! 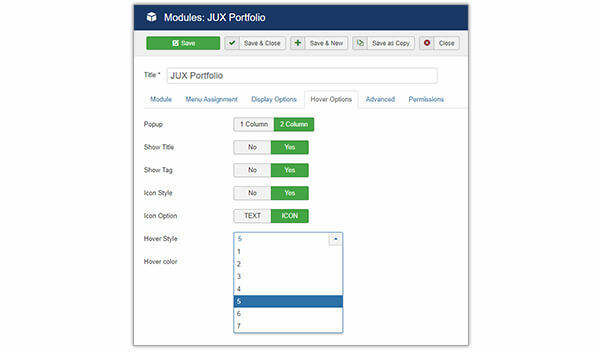 Now you can publish as many JUX Portfolio modules as you want! It’s superb! As you can see in the following image, Tag and Search functions have been styled in a more attractive and gorgeous way. Hover effect becomes more eye catchy and you can totally customize in back-end area. There were 5 hover styles in previous versions, but now, the number of hover styles is up to 7. It means there are more choices for you to renew your portfolio. 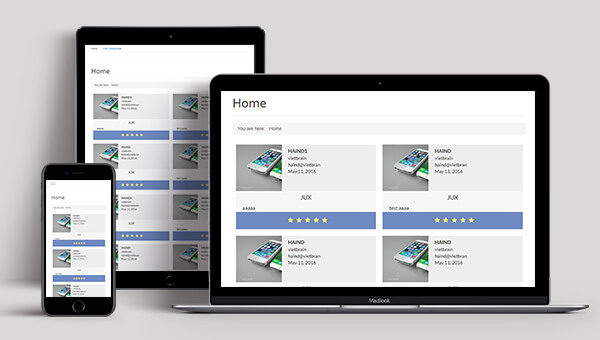 With the price is still €12, JUX Portfolio is a worth-having Joomla gallery module. Poor money but feature-rich product! 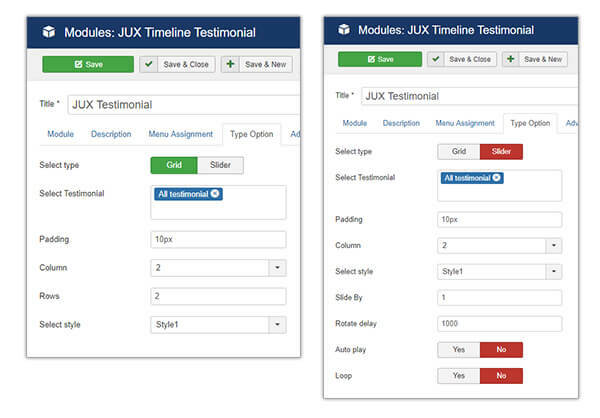 JUX Testimonial is a Joomla testimonial extension which helps you to display all of your clients’ testimonials on your website at different positions with many pre-set styles. In previous version, it’s hard to know which option is active, but in the new version, that obstacle is removed with clear hover effects on each option. In this new version, options for Grid and Slider styles are fixed with unnecessary options (Auto Play and Loop function) hidden for Grid style, and displayed for Slider style. By this way, user experience is greater than before. Update Carousel 2 for Slider style. Carousel 2 is added to this innovation with integration of Loop function for Slider style in version 1.0.7. Switch to Yes or No option and all is done! JUX Testimonial now works perfectly on any screen size. In other words, it works responsively. Awesome! Well, those are updates on JUX Testimonial and JUX Portfolio extensions. We hope that they partially improve your experience in using those two extensions. If not, which features do you think to be updated? We are happy to hear suggestions from you. Please kindly leave your comments below. If you believe what we bring about is helpful, FOLLOW Joomlaux - a provider of the premium joomla extensions to get more and beyond!